Who would expect to find a portrait that was said to be lost right after the Second World War? 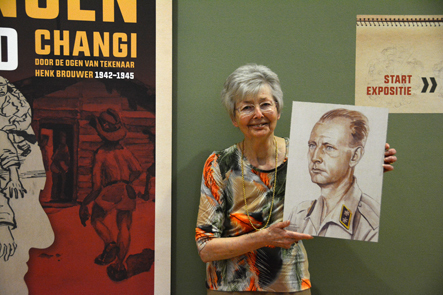 Recently we received a message from Willemine Zitko-Hofstede from Canada, saying that the portrait that Henk Brouwer made in Changi in 1942 of her father Nicolaas Hofstede was found. In 1979 Nicolaas Hofstede published his memoires about his life in Changi, titled ‘De slaven van Roku Ban’. In this book Hofstede mentions the portrait that Brouwer made of him as a way to thank him for his generosity when he shared some food with Brouwer, who was in poor health. Hofstede writes: ‘After the war this portrait from my time in Changi got lost.’ We couldn’t be more surprised to receive the message of his daughter! A few weeks ago Willemine Hofstede came all the way from Canada to meet her Dutch family. Of course a visit to the exposition in Museum Bronbeek was part of the programme. 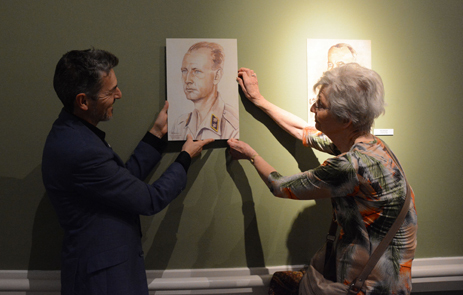 After almost 75 years she gave a print of her father’s portrait its place in the portrait gallery.